Surgical Instrument Washer Sterilizers do not clean effectively. Contact us for pricing that will lower your surgical instrument cleaning costs and deliver the high quality surgical instrument care that you and your surgical instruments deserve. Compact Surgical Instrument Washer Disinfectors cuts costs. Clean full sized Surgical Instrument Trays. ergo Logistics Washers clean surgical instruments safely and effectively with surgical instrument washer racks for cleaning cannulated Surgical Instruments inside and out. Contact us for pricing that will lower your surgical instrument cleaning costs and deliver the high quality surgical instrument care that you and your surgical instruments deserve. The Surgical Instrument Washer is the ideal steris 444 Washer Disinfector replacement improved operating efficiencies, fits into steris 444 washer footprint, larger usable chamber size steris 444 washer and LYNX 6100LX accessories and racks are interchangeable and, the Surgical Instrument Washer is made in the USA. Buy Surgical Instrument Washer designed for thorough and efficient cleaning of laboratory glassware, utensils, and miscellaneous items used in research and healthcare facilities. Surgical Instrument Washer Sterilizers do not clean effectively. Buy Surgical Instrument Washer Decontaminators that wash fast and wash effectively. The Surgical Instrument Washer Compartment usable space is 26” wide x 26" high x 29" deep. The Surgical Instrument Washer Unit: 42" wide x 80" high x 36" deep Sliding Doors. The ideal steris 444 Washer Disinfector replacement improved operating efficiencies fits into steris 444 washer footprint size larger usable chamber size steris 444 washer and accessories and racks are interchangeable. The Surgical Instrument Washer is a heavy-duty, high volume, single chamber, cabinet style washer designed for thorough and efficient cleaning of laboratory glassware, utensils, and miscellaneous items used in healthcare facilities. The Surgical Instrument Washer compartment usable space is 26” wide x 26" high x 29" deep. The overall Surgical Instrument Washer Unit: 42" wide x 80" high x 36" deep Sliding Doors. The ideal steris 444 Washer Disinfector replacement improved operating efficiencies fits into steris 444 washer footprint size larger usable chamber size steris 444 washer accessories and racks are interchangeable. The Surgical Instrument Washer is Manufactured in the USA. The Surgical Instrument Washer is equipped with a dryer. 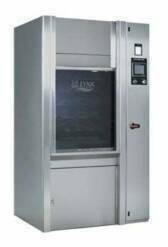 Heated air is re-circulated throughout the chamber at a user-selected temperature: The Surgical Instrument Washer is provided with automatic power activated doors. The Surgical Instrument Washer operator may open and close the doors by the push of a button. If the Surgical Instrument Washer unit is a double door pass-through configuration the automatic Surgical Instrument Washer door logic will be interlocked to allow only one door to be opened at a time. The Surgical Instrument Washer is provided with a cold-water inlet valve, integral with the drain line to add cold water during draining for assistance in reducing the effluent temperature. A Surgical Instrument Washer cold-water connection is required when this option is selected. Vapor created during the wash and rinse phases are collected and directed through internal scavenger exhaust ports to an Vapor Condenser or to the building exhaust. A Surgical Instrument Washe vapor condenser requiring no input of water is provided to remove residual vapors from the wash chamber and to direct the condensed vapors to drain. The Surgical Instrument Washer is provided with an air compressor inter-wired and inter-piped with the automatic control system to supply the air demand required by the washer. The Surgical Instrument Washer compressor is supplied with regulator, filter, and a holding tank. The Surgical Instrument Washer is provided with a high-altitude treatment pump for installations where the elevation is 3000 feet or above sea-level. The Surgical Instrument Washer is designed to comply with Seismic Zone 3 and 4 requirements. The Surgical Instrument Washer is provided with a printer to record all cycle program parameters and process performance data. Surgical Instrument Washer Sterilizers do not clean effectively. Buy Surgical Instrument Washer Decontaminators that wash fast and wash effectively. Buy Surgical Instrument Washer Sterilizers Washer Disinfectors, and Surgical Instrument Washers made with nonproprietary replacement parts. Buy Surgical Instrument Washer, Washer Disinfectors, and Surgical Instrument Washers that deliver long lasting performance. Buy Surgical Instrument Washer Sterilizers Washer Disinfectors, and Surgical Instrument Washers that cut surgical instrument washing costs.